Rochdale started life after Keith Hill with victory against fellow strugglers Shrewsbury. 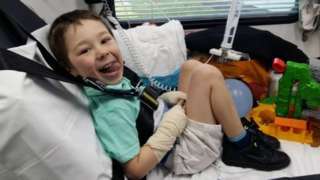 More than £500,000 was raised for Zac Oliver's treatment - including £50,000 from Simon Cowell. Telford teenager Simran Kaur says she feels like she is "representing" Asians and females as she aims to become the first female Asian boxer to represent Great Britain at the Olympics. The 17-year-old is a five-time national champion and European silver medallist in the 51kg category. An appeal's been launched to get some vital equipment for a hospital - remote controls! One ward at the Royal Shrewsbury Hospital had 40 TVs, but just the one remote control, leaving nurses run off their feet and taken away from more vital work, according to a charity. The Severn Hospice Furniture Store in Shrewsbury, however, has come to the rescue - handing over 40 remote controls to desperate staff. Since then, the shop says it's had more requests from other wards at the hospital so it's now started an appeal for people to donate their unwanted remotes. It might not seem much about a remote control but if you're lying there in bed, not feeling very well and you can't change the channel it's pretty frustrating but it's even more frustrating for the nurses as they're getting called away from doing vital work to change somebody's TV channel." As well as weather-related photos, our local BBC Weather Watchers often snap pictures of wildlife in the West Midlands. More than 60 children in the Shropshire Council area have been highlighted as being at risk of child sexual exploitation (CSE). The local authority's Health and Wellbeing board heard how 20% come from outside the county and are in care in Shropshire. The report from Shropshire Safeguarding Children Board said none are currently being exploited but 15 are classed as "high risk". The board said it was confident overall understanding of CSE is improving, but there are still some parts of the country where referral rates are low. The Telford Steam Railway has been given three wrought-iron roof trusses from Paddington station, thought to have been designed by Isambard Kingdom Brunel around 1840. The chairman of the railway, Paul Hughes, said they originally supported "an elaborate roof" over an entrance to the station and that it was a glass construction to "let lots of light in". Mr Hughes explained they'd become available because part of the station was being redeveloped as part of London's Crossrail project. The heritage railway group had to bid for the arches, which are expected to be put up over the planned new station at Lawley. As part of the developments the developer has had to save any historic fabric and then offer to get it reused in different locations." The leader of Telford and Wrekin Council has promised to send a formal request within days asking the government to review a planned reorganisation of hospital services in Shropshire. Yesterday, on a tour of Telford's hospital, Health Secretary Matt Hancock said he couldn't intervene over the decision to move the main emergency care centre and maternity services to Shrewsbury as he hadn't been formally asked to. Shaun Davies, leader of the Labour-run council, told BBC Shropshire the legal request would be sent off, but people in the borough "would not thank me if we rushed those technical papers". However, the chief executive of the NHS trust running the hospitals in Shrewsbury and Telford says he doesn't want any further delays to the scheme. Simon Wright said: "The public have been very consistent in one answer all the way through consultation which is just get on with it." The RAF is threatening to pull out of a training camp in Shropshire if plans for a new crematorium nearby are approved. The new building's proposed for land north of Nesscliffe, between Oswestry and Shrewsbury, and plans are recommended for approval when councillors meet next Thursday. But the RAF Helicopter Noise Liaison Group said a new crematorium "would have irreversible and detrimental effects" on helicopter training from RAF Shawbury. In its written objection, it adds having to avoid flying over funerals at the site in future would potentially mean the Nesscliffe camp could be deemed "unsuitable in the future". However, the planning report states RAF activity in the area has been taken into account in deciding the proposals should be approved. There is the chance of a few showers this evening before a dry night with lows of 1C (34F). A former college is set to be bought by a local council which wants to turn it into a base for housing, officers and small businesses. Telford and Wrekin Council says it's going to go ahead with the purchase of New College and will spend £200,000 drawing up a detailed masterplan and to get planning approval. The authority says it's making the move so it doesn't get snapped up by another developer. It is also considering having a special school on the site. The health secretary says he's not in a position to intervene at the moment in the row about the reorganisation of hospital services in Shropshire because he hasn't yet been formally asked to do so. Health bosses want to downgrade Telford's A&E to an urgent care centre with all critical care cases being treated at the Royal Shrewsbury Hospital. However, during a visit to the Telford hospital today, Matt Hancock says he's currently powerless to act. I'm not yet in a position to intervene because, despite receiving a letter from the council, I don't know why they haven't written to me formally yet to ask me to look at this. I'm expecting them to, because they've written to say that they will, but I haven't had a formal correspondence from the council yet for me to look at this decision." Nearly £500,000 is to be spent on a new CCTV system made up of more than 250 cameras in part of Shropshire. Telford and Wrekin Council and West Mercia Police are spending the cash and say it'll use a secure wireless network instead of cables. They add that it'll go live later this year and will also see mobile cameras used that can be sent to crime and anti-social behaviour hot spots to gather evidence. Another part of Telford's set to be officially classed as a nature reserve. Telford and Wrekin Council says it will officially adopt Lilleshall Hill on 14 March at a cabinet meeting. The move will mean the authority will have doubled its number of nature reserves from eight in 2016 to 16. The council says the new reserve is a haven for wildlife such as sparrowhawks, wrens and woodpeckers. The collapse of an oak tree, believed to be almost 1,000 years old, has been described by an expert as a "tragedy". The Moor Park Oak, as it was known, was near Ludlow, Shropshire, and had stood through centuries of English history. But local tree expert Andy Gordon says he discovered it had collapsed in the past few days and that it was probably brought down by high winds over the winter. We have so many of them [oak trees] and it's just a tragedy that they're slowly disappearing. There's nothing really one can do to preserve them it's just old age finally catching up with them."